This swinging mount pedal assembly combines the brake and clutch pedals in one unit with the master cylinders in a reverse position inside the firewall. It features a lightweight aluminum frame, with high strength reinforced I-Beam style forged 5.1:1 ratio pedal arms. 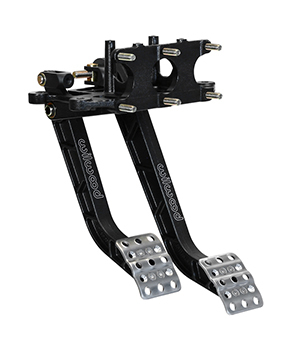 The non-skid waffled pedal pads can be laterally adjusted for driver preference or clearance as necessary. The balance bar incorporates a positive detent stop every full turn to maintain adjustment position and driver awareness. A pin and clevis pushrod attachment system provides highest possible degree of misalignment angle for bind free operation through the entire range of travel. The balance bar can be locked in place with the included jam nut, or used with an optional remote cable for quick on-track adjustments. 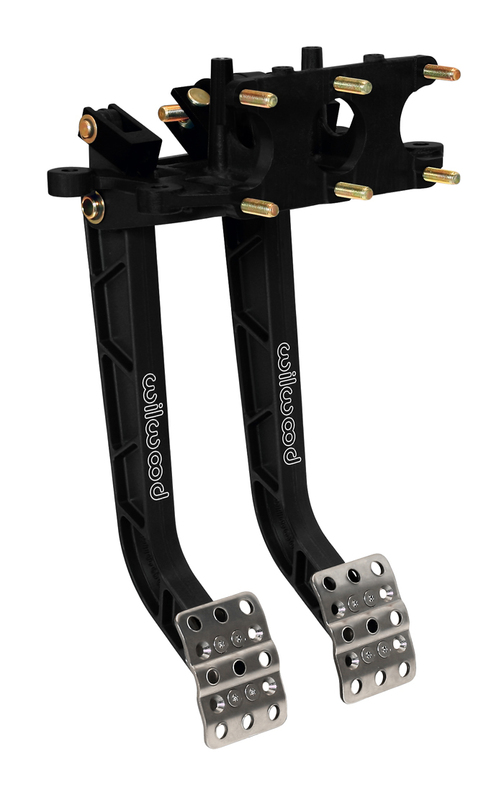 This pedal accepts any Wilwood vertical mount flange single outlet master cylinders that are ordered separately by style and bore size. 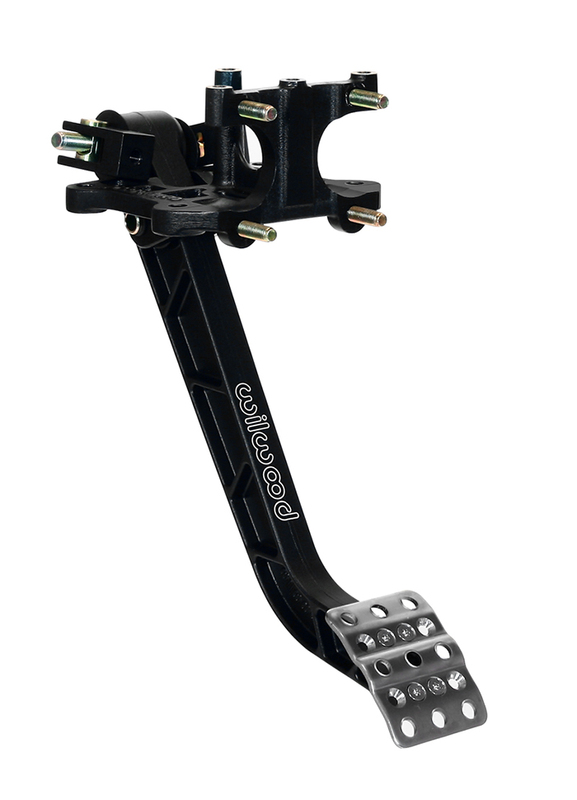 This swinging mount pedal assembly combines the brake and clutch pedals in one unit with the master cylinders in a reverse position inside the firewall. It features a lightweight aluminum frame, with high strength reinforced I-Beam style forged pedal arms. 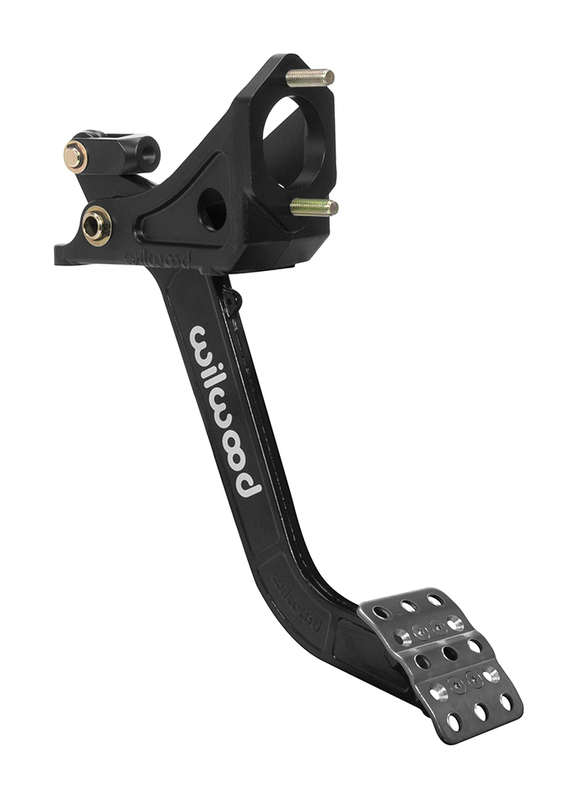 The brake pedal uses a 6.25:1 ratio arm, but with a shorter 5.1:1 ratio arm on the clutch pedal for additional clearance when necessary. The non-skid waffled pedal pads can be laterally adjusted for driver preference or clearance as necessary. The balance bar incorporates a positive detent stop every full turn to maintain adjustment position and driver awareness. 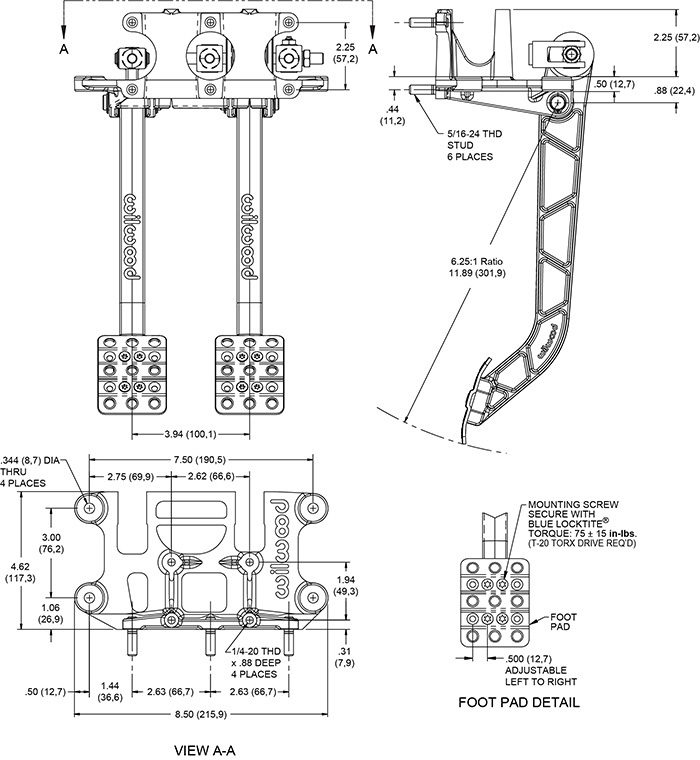 A pin and clevis pushrod attachment system provides highest possible degree of misalignment angle for bind free operation through the entire range of travel. The balance bar can be locked in place with the included jam nut, or used with an optional remote cable for quick on-track adjustments. This pedal accepts any Wilwood vertical mount flange single outlet master cylinders that are ordered separately by style and bore size. . 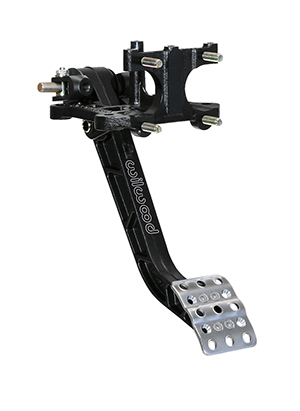 This swinging mount pedal assembly mounts two single outlet brake master cylinders in a reverse position inside the firewall. 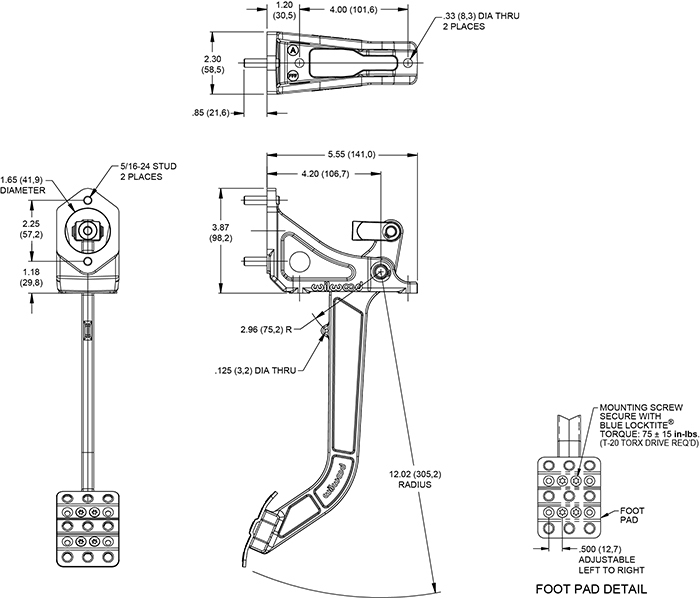 It features a lightweight aluminum frame, with a high strength reinforced I-Beam style forged 5.1:1 ratio pedal arm. The non-skid waffled pedal pad can be laterally adjusted for driver preference or clearance as necessary. The balance bar incorporates a positive detent stop every full turn to maintain adjustment position and driver awareness. 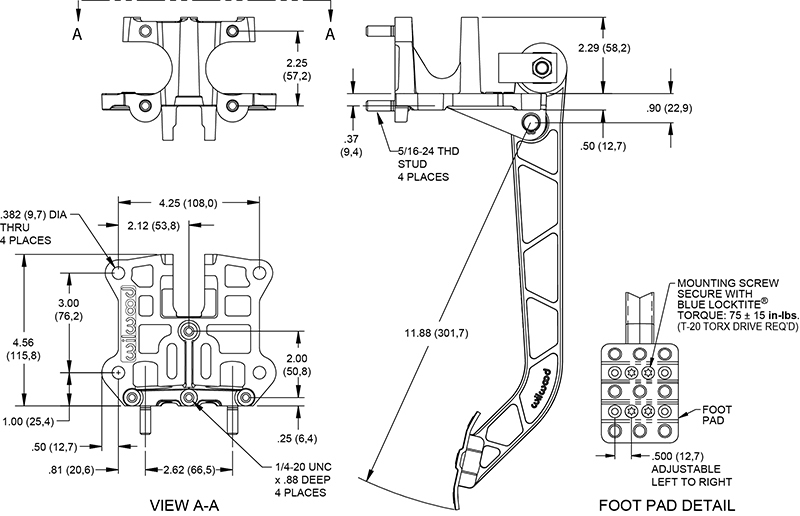 A pin and clevis pushrod attachment system provides highest possible degree of misalignment angle for bind free operation through the entire range of travel. The balance bar can be locked in place with the included jam nut, or used with an optional remote cable for quick on-track adjustments. 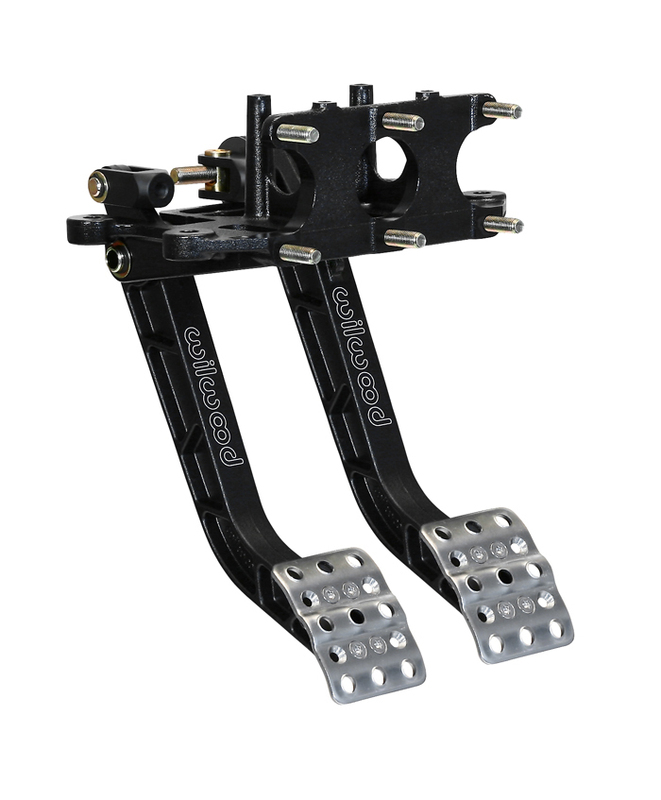 This pedal accepts any Wilwood vertical mount flange single outlet master cylinders that are ordered separately by style and bore size. 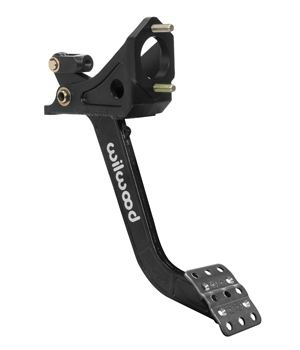 This swinging mount pedal assembly mounts a single brake or clutch master cylinder in a reverse position inside the firewall. 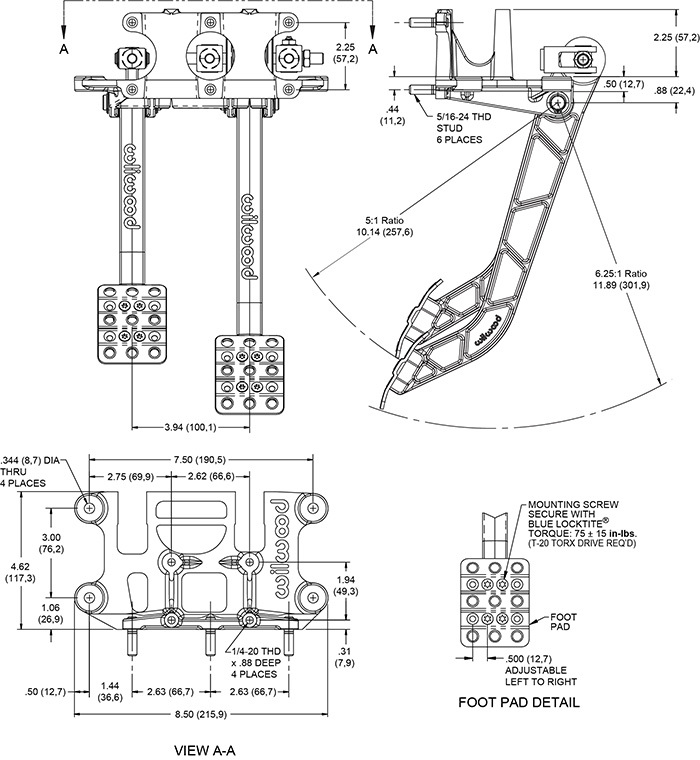 It features a lightweight aluminum frame, with a high strength reinforced I-Beam style forged 6;1 ratio pedal arm. The non-skid waffled pedal pad can be laterally adjusted for driver preference or clearance as necessary. This pedal accepts any Wilwood vertical mount flange single or tandem outlet master cylinder. Horizontal mount flange master cylinders require an adapter kit. Master cylinders are ordered separately by style and bore size.